In addition to a Fitness Center and two basketball courts, the Hinds CC Raymond Campus Wellness Complex features a swimming pool available to both students and non-students. The pool, built in the early 1970s, is located in the very back of the complex near the coaches’ offices. Don Poole, director of the Fitness Center, runs the show while overseeing the pool duties as well. Students that are enrolled in a swimming class do not have to have a gym membership in order to swim in class. However, any student that wishes to swim after class hours is required to purchase a 50 dollar gym membership. Poole was a very competitive swimmer in high school, which inspired him to become a certified swimming instructor, where he began teaching in the Northeast. 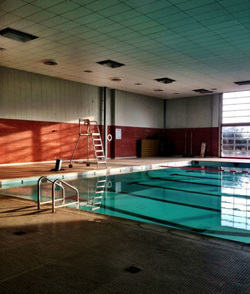 At Hinds, Poole teaches several swimming and lifeguard training classes. “I strongly encourage students to take a swimming class, I love working with the students and improving their skills,” Poole said. An average of 20 members uses the pool every day. The pool hours vary from day to day, depending on how many members decide to swim. “We usually have a good mix between adults and students that swim every day,” Poole said. Wardell Jackson, a sophomore at Hinds, is currently taking a beginning swimming class that Poole teaches. “Coach Poole swims exceptionally well and he holds us to high standards while we are in the water with him,” Jackson said. Poole is a highly qualified swimming instructor who enjoys sharing his knowledge and providing the dos and don’ts. More information about the Wellness Complex can be found on the Hinds website.